Of all the things you can plan for your vacation to a theme park in Florida, the one thing you can not plan is the weather. In the summer months rain is not uncommon in Orlando, typically showing up as a brief shower in the late afternoon. These brief showers can be a welcome relief to the heat and cool the temperature slightly for a more pleasant evening. But occasionally there will be a longer, and heavier storm. That does not mean you cannot enjoy a day at the parks! In fact, when it rains the crowds will thin out and it can be a great time to get in a lot of rides as the wait times drop. Just because it is raining does not mean the rides close. 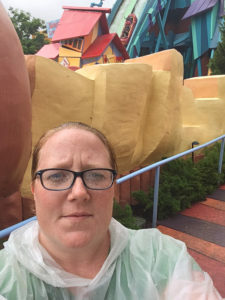 While I was recently visiting Universal Studios Orlando we had a rainstorm and I asked one of the employees about ride closures. They told me that the rides stay open if it is just raining. If there is lightening within five miles of the park then they will close all of the outdoor rides, but indoor rides will remain open. Wear shoes that work well when wet. Even if you have a poncho your feet are likely to get wet anyway as there will be large puddles and pools of water. Sneakers and socks will not feel very good on your feet soaking wet and flip flops might be hard to walk in when they are slippery. A sturdy sandal with straps, or even water shoes, are a good choice for staying comfortable and safe. Wear quick drying clothes. With all of the lightweight, quick drying clothing options available it is easy to find some attractive and comfortable options that will dry quickly if they get wet. These are great options for the Florida heat in general, as they wick away sweat and help keep you cool when it is not raining. I saw many people walking around with bathing suit tops once it started raining as well. You could even wear your bathing suit under your regular clothes and then change if it starts to rain. Pack a ziploc bag to store your phone or camera in. This is a good tip for any day at a theme park if it includes water rides where you might get wet. Dealing with a broken phone or camera while on vacation is no fun, so be prepared with a water tight bag you can stash those items away in beforehand. You can also rent lockers to store your items in, but most people prefer to have their phone or camera on them at all times so they can snap photos or keep in contact with other members of your group without having to run back to the locker all of the time. During a rain storm is the perfect time to ride the water rides! 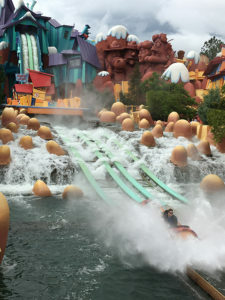 While I was in Islands of Adventure after it started raining we decided to ride Dudley Do-Right’s Ripsaw Falls, which is a log flume style ride. The ride is really fun and has several parts where you are going to get wet—especially with the steep drop at the end! We loved this ride and since we were already a little wet from the rain we didn’t care that we were totally soaked when we got off of this ride. The next ride we chose was Popeye and Bluto’s Bilge Rat Barges. This raft ride takes you through rapids and down some waterfalls and there are lots of opportunities to get wet. It was fun to embrace the rain and enjoy these water rides without caring about getting more wet. Go shopping. Every theme park has a multitude of gift shops to choose from and during a rain storm is the perfect time to explore them. Typically an afternoon shower does not last very long in Florida so it can be a welcome break to relax and meander around the gift shops. If hanging out in a theme park while it is raining isn’t your thing, there are always lots of entertaining indoor options as well. In CityWalk, outside of Universal Studios, there are many restaurants and stores to explore, as well as a movie theatre. At the Cabana Bay Beach Resort there is a bowling alley that also serves food and drinks. And a rainy day is the perfect excuse to enjoy the luxurious spa services at Mandara Spa in the Loews Portofino Bay Hotel. Whatever you choose to do, don’t let a rainy day on vacation put you in a bad mood. You might even experience something you haven’t before—we rode The Incredible Hulk Roller Coaster in the rain and it was an exhilarating thrill, totally different than riding it dry. There are lots of ways to enjoy even the rainiest of days and any day on vacation is a good day! Where in the World are the Agents of Mystical Dream Travel?